Lemon Orzo Pasta Salad - Vegetarian and can be made ahead! 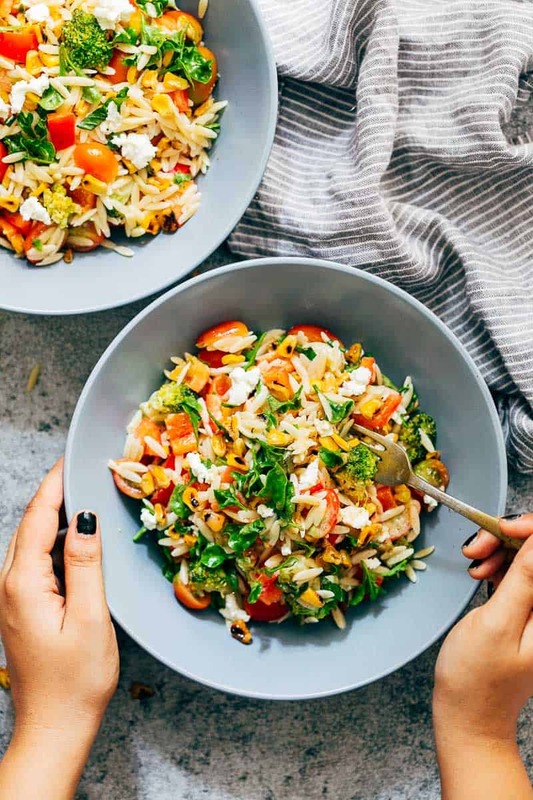 Live your best summer life with this zippy lemon orzo pasta salad! Served cold, its a vegetarian salad that has all the right summer vibes with cherry tomatoes, broccoli, lettuce, corn and bell peppers. Perfect pasta salad for a crowd, and tastes best when made ahead. Hey you! 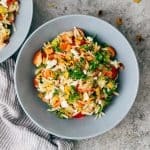 Have you ever tried orzo pasta? It looks like large grains of rice but tastes like the best pasta we’ve ever had. It was all the rage last year I think. And then people had too much of it for a while. But yours truly discovered it recently. And then let the packet of pasta sit in the pantry for three months because umm what if its just like rice? And then there was an evening where the fridge was in a pretty meh state. We found some garlic and pretty sad looking mushrooms, and there was the lonely packet of orzo. It was a feast! I mean mushroom and pasta is so classic. We added some ricotta and we took bites after bites because we couldn’t believe there was pasta out there that tasted so interesting. And there you have it. 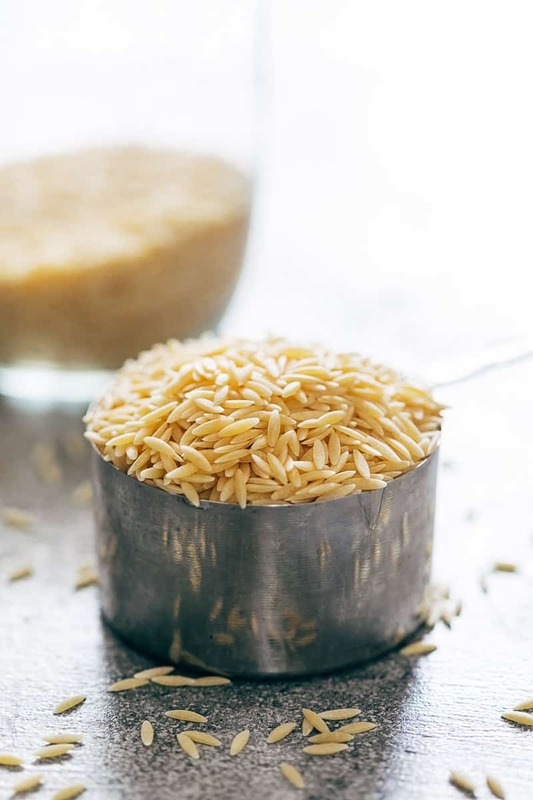 My love affair with orzo, which I’ve been using in everything. Back to this zippy, summery lemon orzo pasta salad – perfect. perfect. perfect. We are talking about large bowls of salad that have the ability to transform easily into dinner. And can be eaten cold when its too warm outside. And tastes like sunshine. This is a really easy salad to build, and I urge you to experiment with things you like in salads, change up the amounts, use more of this and less of that to make a salad that you will truly love. We’ve added produce thats available in the market now. There are no canned things here, because then whats the point of a salad. Everything except the corn is fresh and tasty, because I had some frozen corn on hand, and it easier to roast it on the pan than peel and prepare fresh corn. Also don’t let me dictate how you dress this salad. You can just go with lemon juice, olive oil, some salt and pepper and you’ll be good to go! But what we are doing here is really infusing the salad with lemon flavour, so that when it sits in the fridge for a few hours, all the veggies and the pasta soak up the lemon flavour, and you really taste ‘sunshine’ when you take your first bite. This lemon pasta salad dressing uses both lemon zest and lemon juice for maximum flavour, because the zest is where its at. If you don’t have access to lemons, use limes which are more tart but definitely work here in a pinch. The other ingredients are olive oil, minced garlic, a dash of honey or maple syrup, vegan mayonnaise (which is awesome), paprika and some salt. The mayonnaise (vegan or regular) adds a nice creaminess and keeps everything together. I highly recommend getting a microplane zester for your kitchen because its super useful for zest-ing lemons, limes, grating garlic, ginger etc. I want to host a picnic just so I can take a big bowl of this salad. Because chilled hibiscus tea, lemon orzo pasta salad, maybe some strawberry cheesecake. Its a plan! 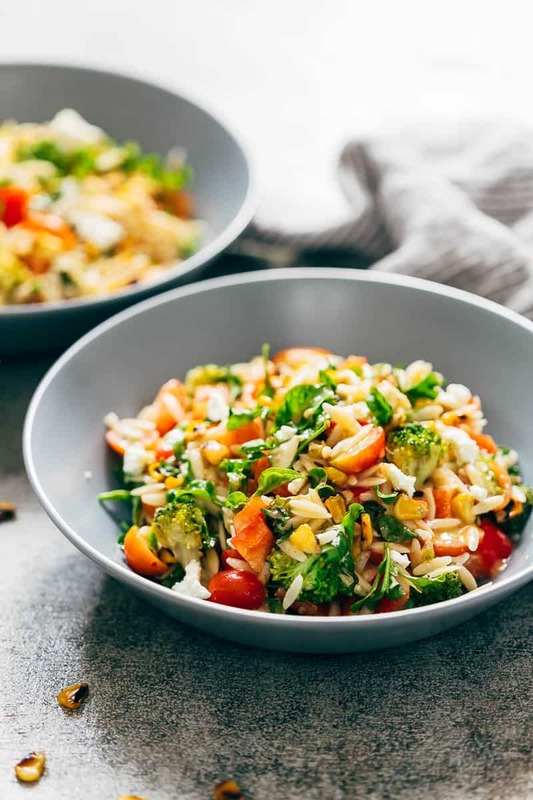 Super zippy and summery lemon orzo pasta salad is vegetarian, and bursting with summer produce. 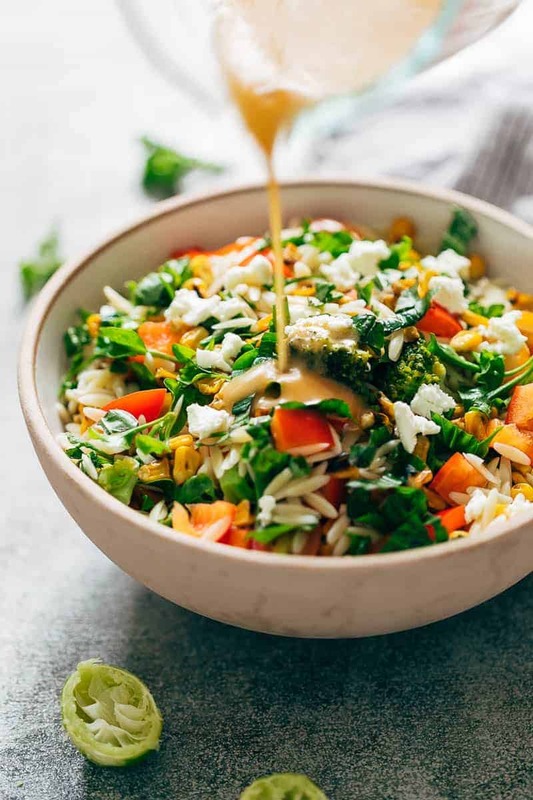 Tossed with corn, broccoli, cherry tomatoes, red bell peppers, spinach, feta and a light but delicious lemon salad dressing, this salad is perfect to make ahead and serve cold. Pasta: Cook the pasta in salted water according to package directions till al dente. Drain, wash with cold water to cool the pasta and set aside. Prepare Veggies: Heat olive oil in a pan and roast the corn kernels on high heat till slightly charred. Remove the corn, and add the broccoli to the pan. Cook the broccoli for 2-3 minutes till slightly soft, but still crunchy. Combine: Add cooked pasta, corn, broccoli, tomatoes, bell peppers, lettuce and feta (if using) to a large bowl. Whisk together all the ingredients for the salad dressing in another jar or bowl, and pour all over the salad. Mix well and refrigerate for a few hours before serving.